We are looking for parent/carers who would be interested in getting involved in a whole school sewing project, culminating in a fundraiser for the school in May. This is being led and managed by KAA parent Lisa Nash, who oversees the Flourish programme – a local school holiday family arts initiative, and the Grenfell Memorial Community Mosaic. The ambition is to make 300+ bunting flags featuring the schools core values, mottos and house teams on one side and green hearts on the reverse, which will then decorate the dining hall and under the canopy on the nearby terrace at the fundraiser. Lisa sees the project and its outcomes as an example of how our school community, including parent/carers, can work together and create something beautiful for a good cause. 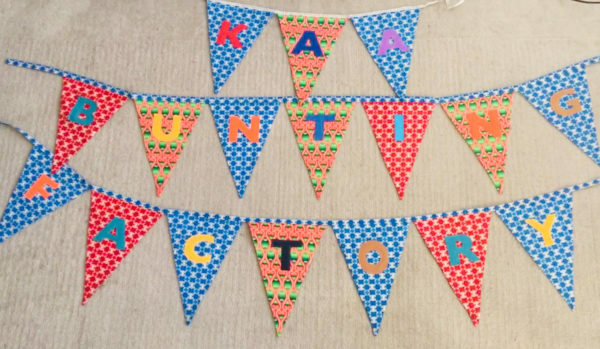 The Bunting Factory workshops will take place on Monday afternoons (1.30pm-5pm) after half term, commencing on Monday 4th March. Knowledge of using a sewing machine is useful but not essential. If you have further questions, please email Vashti Turner at v.turner@kaa.org.uk.